I just love when this big ole world because a “small world” through blogging! I got emails or comments that some of you readers know my best friend in Connecticut, my grandparents in Utah, or know me and I didn’t realize you came here, too. I’ve read all your comments here and on my blog and just kept smiling at the kind words and stories you have shared with me. Thanks for making my day brighter! First off, I live in Austin, TX but visited Utah recently when I photographed Amy’s family. I shot her session in downtown Ogden near the train depot. I drove around 5 minutes before I met her to scope out spots, and was lucky to find some. Fortunately it was a weekday morning, because someone mentioned it was a popular spot on the weekends. Ok, onto my first topic. *For a printable version of this tutorial click here. Since a lot of the questions I got involved effects of certain images, I thought I’d start with the most important and basic idea you should know about your camera. (some might say adjusting white balance is a 4th, but I keep that on the shade setting or AWB (auto) and will adjust in photoshop if I need to. Most of my shooting is in open shade, so I keep it on the shade setting). (I will give a brief explanation below, but if you don’t know those terms at all, may I suggest the book Understanding Exposure. I have it, and I hear it is AWESOME by many photographers, but I just don’t do books well. I like to make things harder for myself. Google and Wikipedia are also excellent, basic resources such as here and here). This is my camera body, all will be a bit different, but still similar. As I change settings, I adjust in this specific order. I shoot 99% in natural light, so first I survey where I will be shooting and determine my ISO (formerly known as film speed). I have shot in a darker room with only ceiling light up to 1600 ISO. It often comes out grainy, but you can have it well exposed this way. This seems to be a good reason to buy a professional body such as 40D or 5D because they have a better ability to capture images with a higher ISO, unlike bodies such as Rebels. A photographer friend on facebook just got a new camera body and wrote, “1200 is the new 200” which I thought was funny. With that, she meant that she can shoot up to 1200 and have it look as crisp as her previous body could shoot at 200. 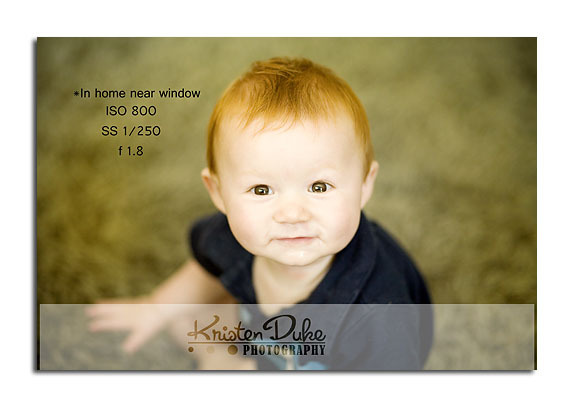 I would think that those of you wanting to just take better images of your kids, this isn’t necessary. Your flash can help with that just fine in darker places. Once I have determined my ISO according to where I am shooting, I then move onto my f-stop/aperture. There are reasons this is known interchangeably as both, but look it up if you wanna know more! I will use aperture here. In deciding which aperture setting, I have to ask myself—what lens am I using (the better the lens, the ability to go to a lower aperture). An inexpensive lens I often recommend is the 50mm 1.8. It sells for about $100 for both Nikon and Canon, and can really teach the effects of a low aperture with its’ ability to go down to 1.8. I used that as my sole portrait lens for a good 2 years. When I first learned about it, I thought, “but it doesn’t have zooming abilities…” and a friend of mine said, “YOU are the zoom.” It took some getting used to, but a fixed lens (doesn’t zoom) also produces very crisp images. With an individual, a 1.8 works and if you focus on the eyes, you can get a great depth of field or blurry background (popular question, will answer it more detailed in a later post). If you focus on the background though, you will get a blurry face. You have to change your focal points to achieve this properly (again, later). With a younger child, I’d say something like a 2.2 is good because if they are moving, it will blur their face too much going much lower. Plan to keep your aperture at a number with the number of people you have in the shot. With 2 people, a 2.8. With 4 people, a 4.0. With 8 people, an 8.0 and so on. If I had a large group of 20 people and I shot at 4.0 or 5.6, I run the risk of having those in the center in focus, and those around the edge out of focus. In instances like that, I make sure I have a good “border” around them of trees or background, to better ensure the entire group is in focus, along with my higher aperture. Lastly, I adjust my shutter speed. With people, I NEVER go below 1/125 or you will often get out of focus images simply due to camera shake (you think you are holding still, but really you aren’t). Unless you are on a tripod shooting nature. That is my stopping point. Usually 1/250 is good as my lowest, and often go much higher (1/4000) if it is really bright outside. I set the other two, and just play around with this. This is the easiest to change quickly as needed according to the light. Here is my example as the sun came in and out from behind a cloud. The first three are shown SOOC (straight out of camera, no editing involved) and the last is after editing. I want you to be able to see that the images are fairly consistant, yet I had to keep changing my shutter speed as the sun came and went behind a cloud. The third one has more red skin with the sun, but the red can be reduced in photoshop. I don’t often shoot in full sun, so don’t come across this dilemma often. Editing can’t fix a bad image, but it can enhance a good image to look amazing. More on that later–isn’t this long enough? So here is a challenge. Go outside in the open shade. Next to a fence or bush that is shady, but not too dark. Take a child or stuffed animal and place them in that spot. If it is your child, don’t get them all dressed up because they you will get upset if the images don’t turn out right. Don’t even worry about a smile or them looking at you. Just take the shots to practice and learn! If it is too bright still, crank your shutter up to 1/300. If it is too dark, go down to 1/125 or move your ISO up to 400 or 650 . Adjust your settings until you get what you like. If you don’t know how to adjust your camera, see the manual for your specific camera, each model is a little different. I hope that helps you get more familiar with your camera! It is a LOT of information, but if you really study this post and possibly use that book/links I suggested, you will be SO much closer to properly exposed images and you will be so excited! Seriously, something worth cheering about. It is scary, but such a major accomplishment as you get closer to understanding this complex formula. Please, let me know how your experiment goes! Any questions on what I wrote here? I will answer in the comments as you ask. LOVED this POST! Great information on photography; I'm always looking to learn more about this. Thanks! This post is great timing for me. I am in dire need of a good camera for my "after" pictures from my color consultations. I will look into this one! Thanks so much for the GREAT post. I've learned a LOT, and you made it sound so simple. I'm heading out to try it now. THANKS!!! Great information, thank you! I don't have an SLR camera yet, but hope to in the future so until then…I'll have to get the book you suggested so that I'll be prepared! Thank you! I am interested in photography and loved reading your post. I feel like I know a little bit more about it now. Thanks so much for this easy to understand,concise, and useful information. I'm still saving up for my SLR, and I've been a bit intimidated by the thought of getting it, but I feel a lot more prepared now! This was a priceless post!! Thank you for the great information. And what amazing photos. I may just take advantage of your offer to ask you some more questions…I have a DSLR- love it! But know that I am not using it to it's fullest potential! Thank you, thank you, thank you! I am so excited to try this out. I have only had my camera for a few months, but still feel like I don't know anything!! This is totally helping. Now to practise. We shall see how it goes. Thank you! I'm so excited to see your excitement! If you don't have an slr, many pocket cameras also have manual settings, check and see if yours does. And Rebels are great, don't feel you have to upgrade your camera to do this, I was just stating that higher end bodies can do higher ISO's, but in most cases, you rarely need a high ISO. Also, I edited the info under the line of images I put because I couldn't even read it. I loved this post as well. I LOVE photography and am always looking for ways to improve my "art". Thanks for sharing and I look forward to more. I took a digital photography class 2 years ago and I learned more from you in this post than all of my classes. Better Life Bags~I did end up getting the 1.4, and I don't think there is that much of a difference between 1.8 and 1.4. If I remember correctly (and I could be wrong) the 1.4 just might be a bit better glass, but I'll go look that up to verify. I think the 1.4 is $300 vs. the $100 1.8. Thanks for all of the tips. I am excited to start practicing. I'd say still go for the less expensive, as as you find you like that and want a little more, you can sell it and upgrade. I like to recommend teh 50mm 1.8 because it is an awesome lense for the price. So how much do I owe you? :) Seriously this was the most help I have had since I bought my camera 3 months ago. Love it, I almost want to cry I am so excited. I have so much interest in photography and I keep struggling to know how to get started. I shoot basically in aperture, so I am excited to take your challenge and go out today and shoot in MANUAL. Thank you!!!! I have on my 2010 TO DO list to learn ISO, aperture and exposure and your post helped a light bulb go off in my head. 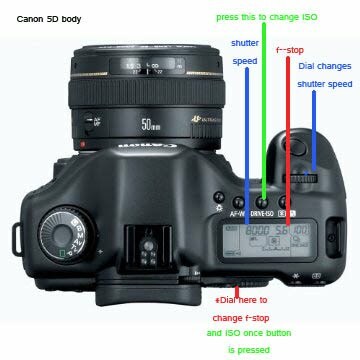 The diagram of your 5D (I have only a 40D…and now it's showing an error 99, ugh!) is just awesome. I plan to print off this post and make it into a little booklet to keep with me in my back pocket when I go "shooting." I will also practice on my middle child, who is the most likely to pose for Mommy while she practices, ha, ha. For a question, what is the best way to get a custom white balance for indoors. Our LR walls are painted a tan that is on the yellow side and everything looks yellow, especially when it is lit by lamps. Any pointers? I am with everyone else – thank you so much for all the help! My sister is a photographer and even after her explanations I was still confused – you cleared up so many of my questions! I got the Canon Rebel xsi for Christmas and I have to admit I get frustrated with the aperture options on the lenses that came with it. I don't have a mounted flash (need to save for one) so I can't bounce off the ceiling when I'm shooting indoors with my lowest f-stop of 4.0 (and I hate the shadows cast by the standard flash). Maybe I'll add the 50mm 1.8 lens to my wish list. :o) It's a LOT cheaper than getting one with that f-stop that can zoom!!! Wonderful post! I just received a Nikon D3000 for my birthday so it was nice to read something that wasn't so technical. After shooting with a P80 for the last year and a half it was time to upgrade. Your post will be printed and tucked away in my camera bag. Thanks! Ditto what everyone else has said. Thanks for all the info in an understandable, concise format!! This is probably a dumb question, but you've got me wondering, how do I know what f-stop my lens is? The lens that I most often have attached is a Nikon 18-55mm lens. It has "1:3.5-5.6G ED" on it. Does that mean the F-stop ranges from 3.5 – 5.6 as I zoom? If so, do you recommend investing in a mounted flash to get better indoor shots? Holy cow! I didn't know you lived so close! My hubs is stationed up here at Fort Hood! Thanks for the camera tips! Going to have to maybe try some of these out! I am so grateful that I was able to assist in the lightbulbs going off in your heads! I hoped it would all make sense, and glad that it does. Kara and Kevin~Owe me? I like blog comments:) I am a big advocate of blog love. I like to give and I like to receive. Joan~I plan to cover cameras and lenses in my next post, but yes, it is typed on the lens its' range. I will do more research b/c I'm not 100% sure on this, but on the lens, it usually puts its lowest fstop (either 3.5 or 5.6 in your case) but not the highest. Turn your dial and see its range as you do so. Most 18-55mm lenses are kit lense and don't have the greatest ranges. THANK YOU for explaining this so clearly!! I loved that you explained the relationship between all of the settings. I am an amateur photographer http://nataliedalpiasphotography.blogspot.com/ … and totally relate to you. I took photography classes in high school (6 years ago, black and white FILM) and even though I know what ISO and aperture mean, I do NOT know how to use them and am SCARED to death to take my camera off of auto, especially when I'm being paid to shoot. I always think the camera knows better than I do. Anyway, I am shooting preschool pictures tomorrow and thanks to your tutorial and hopefully lots of practice with my 2 year old today, I will be shooting completely manually!!! Thanks for the help! I look forward to learning more! I've been so scared to try manual as I could never figure it out:) So thanks!! You've given such great information that I think I'll be able to pull shoot in manual with a little practice. Thanks! Hey Blair! Good memory, I even have a different last name and you still recognized me…impressive. I saw some of your recent pics on Nicole's album–fun gathering of old friends. This was VERY informative and easy to follow. Thank you! I really like your rule of thumb for aperture settings. I shoot with a Canon Rebel XSi. When I dial it up to 1600 ISO or even sometimes 800 ISO I turn on the High ISO Speed Noise Reduction. It doesn't take away all grain but helps dramatically. I have tried a Ti (I think that is the right model #) and the ISO goes up to 3200 and looks crisper than mine at that high of an ISO. I think that is a more afforable camera body too. Just a thought. :) I hope you keep posting! I really enjoyed this article. Thank you for this post! I bought my very first Digital SLR camera A YEAR AGO, and I still shoot on Auto. I have been meaning to learn the ropes, and this post will kick me in the pants! One question though. Is there anyway to ever shoot a clear, colorful picture that doesn't need any editing from photoshop? I just want to say THANKS! I have not really gotten myself back into photography for 6 years. 6 years ago I was developing film, not doing digital. About 6 months ago my husband told me to just go buy us a fancy digital and get back in to it. I did buy a camera, but and needed someone to re-explain things. It is amazing how quickly you can forget things. Again, thank you. I am going to go have my own little photo shoot right now! Stacey, digital photography doesn't produce as colorful images SOOC as film slr's do. I heard it once said that images are "foggy" and photoshop (or another editing program) gives them the boost that they need to bump them up to the quality that is produces SOOC with film slr's. In my opinion, a properly exposed image is not enough, it needs to be enhanced slightly (and each photographer's formula is different) with some editing on the computer. What AMAZING information!! I am a self-taught photographer who has battled/struggled with shooting manual. I have gone back & forth between auto & manual MANY times because I just couldn't figure it out & wasn't satisfied with the photos I took on manual. I think this post will help me a LOT! I will definitely take your challenge & I've already printed out your info to tuck into my camera bag. THANKS SO MUCH!!! Maybe this question was already address, but I would be interested in how to decide what camera would be best to purchase. Or at least your opinion. I've been looking into an SLR for a while, and love to hear everyone's ideas. I'm struggling a little deciding. Thanks! Nic, I'll cover camera's/lenses in my next post. This was such a great post. I've been studying a little bit and have been so confused. You explained it step by step which is what I needed. Thank-you so much! Just curious, would you recommend a Nikon d90 SLR camera? I've been looking into that one and just wondered what your thoughts were. Thanks again!!! I just bought a Canon and was so excited to see this post. It is going to help me sooooo much!! Thank you bunches!! Wonderful Post! I am SOOO excited to read more! Thank you for sharing! As far as other questions go, can you tell me what you do in Photoshop to "pump up your images?" Thanks again for this great post. LOVING it! Amber~I'm Canon and don't know much about Nikon's, but I do know that Nikon/Canon–both great choices. THANK YOU! THANK YOU! THANK YOU! Just what I needed. WOW. this was ridiculously helpful! I, too will be printing this off. I'm shooting with a Fujifilm Finepix S700 at the moment on manual and still feel like I'm guessing on the settings but now I can be smart about it! Hopefully I get quite a few suggestions! Thanks so much for this post! I have a great camera, and am learning a lot with it, but really needed someone to give me a better place to start with my manual settings than just "play around with it". Thanks for the specific ISOs, etc! I'm going to go outside and play around with it tomorrow! Amazing. Have never heard or read to keep aperture at humber of people in shots. that should improve my blurriness alot! :) thanks so much for awesome post. cant wait to print it out and try the last "assingment" when this rain stops today! so glad I found your blog. i am a new fan!!! Stephanie~It's tough for me to recommend camera bodies because I really don't know much about models besides the ones I have. I will do my best to go into a good explanation when I talk body/lenses in my next post. Keri~That aperture for groups is my personal rule of thumb, not sure it is foolproof, but it seems to work for me. I don't necessarily shoot at f20 when I have 20 people, but at least an f8 with a big border of trees around. Tell me more about the blurriness you are experiencing and what fstop you've used. It may also have something to do with the shutter speed you had set. Email me an image and tell me your settings. Thank You for the great post!! I have played with my camera a lot lately and i have stayed on "P" and really like it. I would like to know what you do in photoshop as well…i have read a few blogs and its so overwhelming. I am like you with books…dont do so great!! Thanks!! Oh my gosh these tips are so helpful thanks for posting! I have a Canon xTi. I've been playing with it for some time, but you make it sound so simple. thanks! I usually keep mine set on aperture prority, but now I can try some more. Thanks so much! Great article! Thanks for sharing and looking forward to the next ones! Thanks! LOVE THIS!!! I didn't know I needed this information too! This will really change how I approach my photogrpahy as well! Thanks Kristen…You're amazing! Idea Room readers…thanks for all the great questions and comments. Isn't Kristen the best for sharing her photography secrets?? Thanks Kristen for this awesome post!! I got my firs dSLR last mother's day…and I'm LOVING it!! I took it out of auto right away, I bought the camera to learn and have control of those settings….it took a while, but I'm amazed at how much more I understand all the settings because I simply USE them, and try them!! I'm currently working on a 365 project(on flickr – under tidymom) and I have to say, it's been an EXCELLENT learning experience…especially putting them on flickr and getting a lot of support and inspiration there!! I LOVED your tip about aperture and the number of people in the shot!! I'm going to try that! I'm a Nikon girl, and have the D40 – and after a year, I'm already wanting to upgrade….mainly because of the ISO issue you mentioned, and I the inexpensive 50mm wont AF on the D40….so I went with the 35mm 1.8 for $200 and have been LOVING that lens…I may get the 50mm 1.8 and learn to manual focus with it…then I can still use it if/when I upgrade! Can't WAIT to read more posts!! Thanks so much to you and Amy for doing this!! You are amazing, you've summarized what I've attempted to learn in book after book. Thanks for these very practical tips! Thanks for the help! Just bought a Canon Rebel and I’m excited to get away from Auto mode!! I think your tips will be amazing! Looking forward to getting started! !